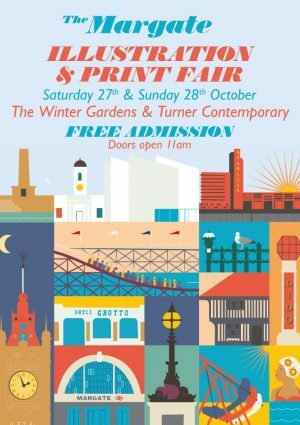 Really looking forward to being part of this Illustration and Print’ Fair in Margate, one Fair but at two venues. The first venue will be the iconic Winter Gardens (where the Beatles played). This will be our main venue with 55 exhibitors, bars, seated food area, exhibitions, print collectives and more. The second venue will be at the Turner Contemporary Gallery with 20 exhibitors whose focus will be 20th Century Graphic art, Fine Press Books and book arts. There will be 75+ exhibitors in total across the two venues showcasing a range of printmaking, artist’s books, 20th Century design, zines, screenprints, risos, ceramics and contemporary crafts. This is an exciting opportunity to see contemporary printmakers and makers showcasing their work.